Show your support with a small, simple donation and we will thank you on our dedicated patrons page. Keep our gallery thriving and reward yourself with a tea or coffee in your very own VanGoYourself mug, beautifully printed with our logo. Help us to add another fabulous painting to VanGoYourself so that more people can discover the amazing collections inside museums and galleries. We will contact you to let you know which painting you have sponsored and you will see your name credited on the paintings page of our site. You can then check back regularly, at any time, to see how your painting is doing and look at any recreations made. Get everything in one beautiful package for a special price. THE ART LOVER + HAVE A DRINK WITH US! + ADOPT A PAINTING = SuperFan. Support us to release paintings from more countries. Your donation will allow us to build an exciting set of images from a range of countries and collections across Europe. Tell us which countries you would like to see represented on VanGoYourself and we will focus our efforts in that direction. We will contact you to let you know which set of paintings we have added and your name will be credited alongside ALL the paintings added as a result of your donation. Have your own exclusive pop-up VanGoYourself event, designed to take place for you and your friends or colleagues in Brighton, Barcelona or Berlin. On an afternoon of your choice, members of the VanGoYourself team will arrange everything for you to recreate a famous painting in a fabulous historic location in one of the three cities. We will bring all the props and costumes, take all the pictures, do all the organising and bring the drinks and snacks! All you need to do is turn up with your group, have fun and create your own art. 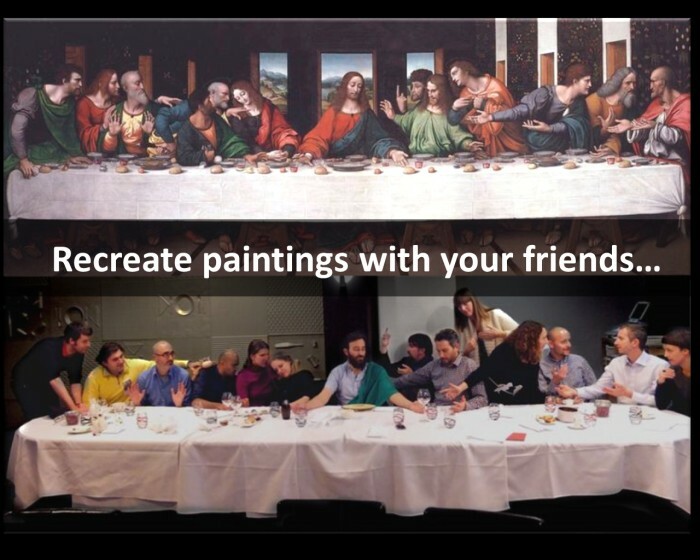 VanGoYourself and your team at your next staff meeting, conference or party. We will help you by providing top tips and ideas on how to make your recreation fun for everyone and get the best result for your team. 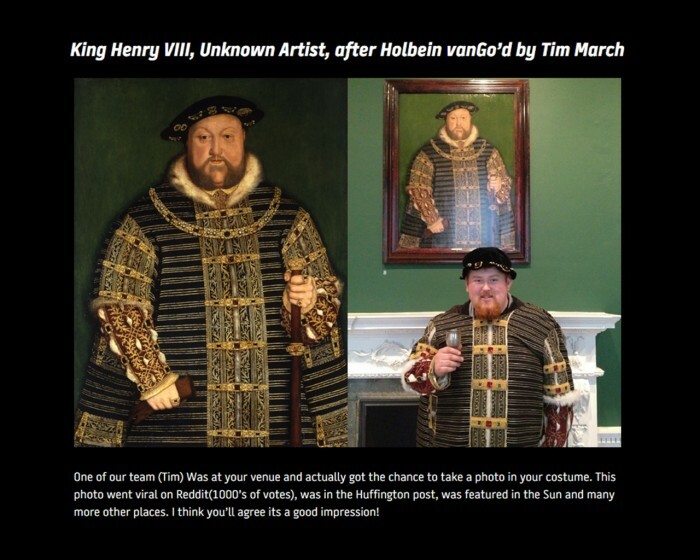 We will feature your re-enactment in our VanGo’d gallery and credit your company with a logo and link to your website so everyone knows how much you love the arts. Is your business looking to support the arts? Do you believe in the power of art to transform lives? Do you want to be associated with a fun, friendly, creative art project that is transforming the way people connect to culture? This is a unique, one-off opportunity to become the VanGoYourself headline sponsor and get your company logo on our site and all our associated communications with both the public and our community of hundreds of museums and galleries across Europe. Working with museums and galleries around the world to find the best of their open licensed artworks to offer to our audience to recreate. We curate the submissions, selecting the best of the masterpieces for our VanGo'd gallery. The very best each week are also featured on the homepage. All the submissions are published online on our Tumblr and we work to share many of them far and wide through our social media channels. 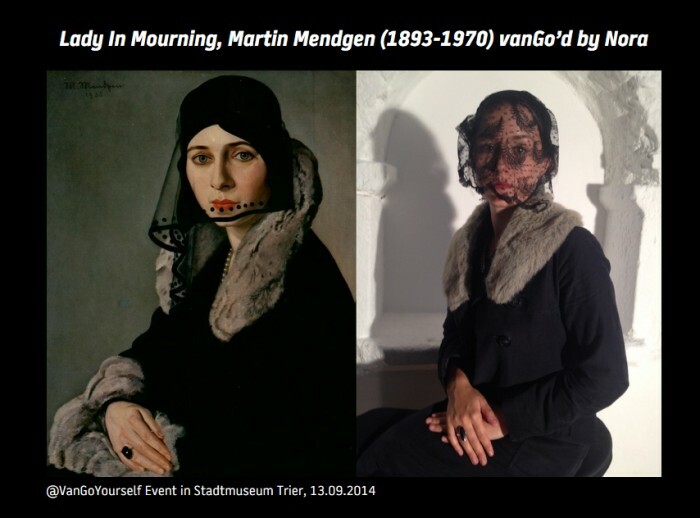 Supporting and encouraging museums and galleries to put on their own live VanGoYourself events complete with costumes, props, helpful staff and a good laugh. This task is all about making is easy for venues to stage their own events. To do this we will create free resources and case studies (available in Spanish, English, German and French) that will allow any cultural organisation or community group to hold their own VanGoYourself event. Using VanGoYourself as a way to get people into art, to have fun with paintings and to share their recreations with friends. This task is both educational and promotional and will involve working with museums, galleries, artlovers, bloggers, publishers and brands all over Europe to help to spread the love. 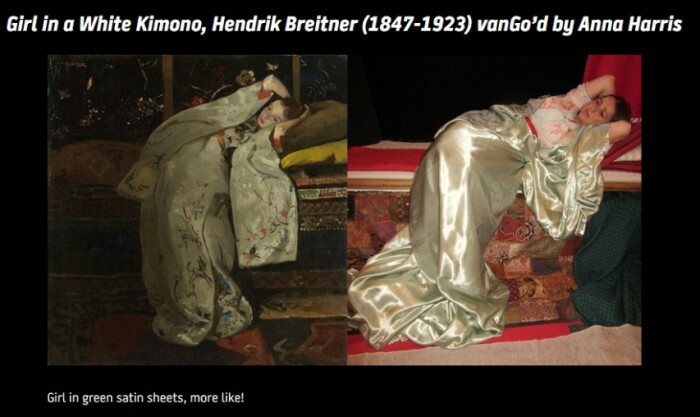 In addition to curating the submissions and selecting the best of the masterpieces for our VanGo'd gallery, we will promote the use of our simple embeddable widget to ensure that cultural venues, publishers and online subject enthusiasts can feature the best of the recreations on their own sites. Do you believe in the power of art to transform lives? Do you want to be associated with a fun, friendly, creative art project that is transforming the way people connect to culture? By supporting us you will be helping more people across the world to discover and enjoy art in a very personal way. We will focus on working with museums, galleries and collection holders of all sizes across Europe to add their works of art for people to recreate at home, from famous masterpieces to undiscovered gems. We will also offer support to cultural institutions to run their own live VanGoYourself events, helping to develop new audiences and deepen engagement for visitors. We will work to build a community of people from across European borders who love getting hands-on with art. We will support the ongoing work to free up the wealth of digitised cultural resources and showcase them to a wider audience. Tired of just looking at paintings? Now it’s time to get inside them and rediscover art in a whole new way. VanGoYourself is designed to help you engage in classic paintings from around the world by putting you and your friends inside the art. 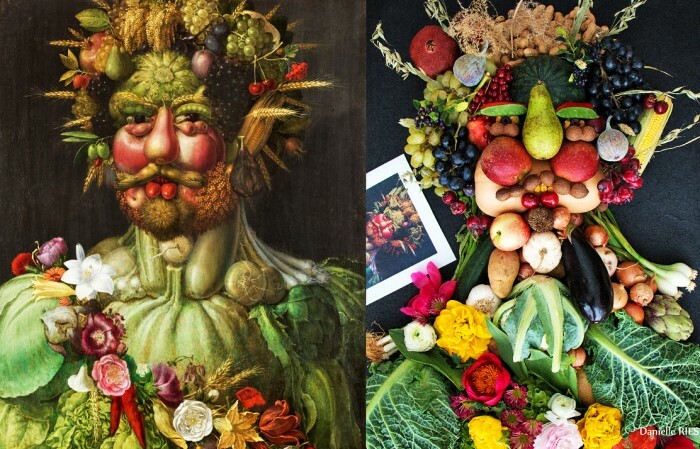 Have you ever wanted to recreate a version of Vermeer's Milkmaid in your own kitchen or get together with your friends on a Saturday night out and recreate the scene in Leonardo Da Vinci’s The Last Supper? We did. First channel your inner artist, then pick a painting from the selection on the VanGoYourself.com. Get together with your friends to recreate the famous scene, take a snap and upload it to VanGoYourself, which will twin your new master with the original artwork for you to share on social media – thus immortalising your artistic talent for all to see! The site uses tags to allow you to choose the level of difficulty (‘Easy to Recreate’ or ‘Challenge for a Master’) and the number of people. You can also choose using tags such as ‘Romantic‘, 'Pets' or from a range of art historical terms. The site is free and simple to use, and links up to existing widely used social media channels such as Facebook, Twitter, Pinterest and Tumblr. 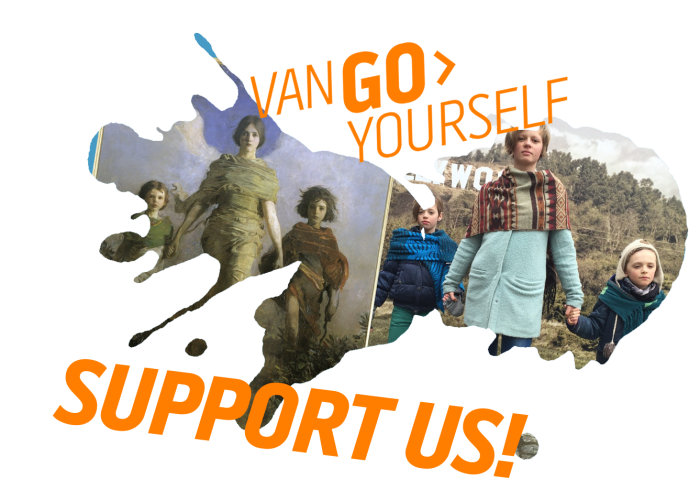 We curate the best of your recreations in the VanGo’d gallery and there is also an unmoderated VanGoYourself.tumblr.com where all the submissions, good or bad, are published together. 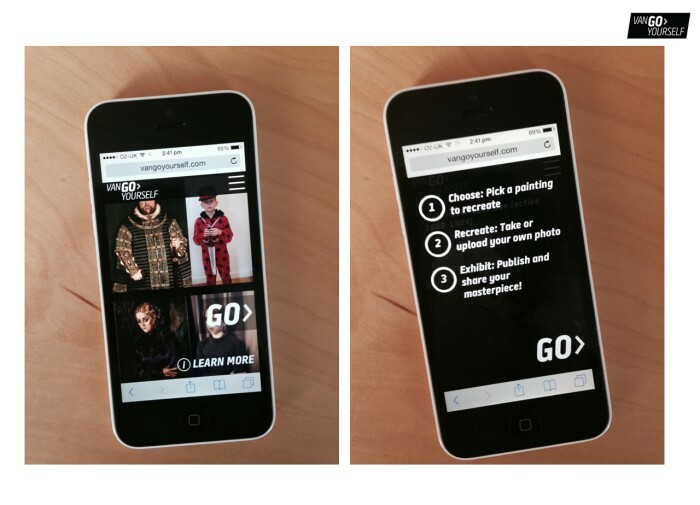 In January 2015 the 'Embed VanGoYourself on your Site' widget was launched. It allows anyone to embed a live feed of VanGo’d images onto their own website based on any of the tags. The target group of the widget is collection holders whose paintings are being recreated on VanGoYourself and who want to reach out to new audiences. It would also be used by cultural publishers or bloggers with a passion for art. Art is the soul of society, it helps us to understand the world and relate better to ourselves and the communities we live in. It helps us to make connections across cultures and generations. It also encourages galleries and museums to be open, playful and innovative with their collections and resources. VanGoYourself brings the art gallery to you wherever you are. 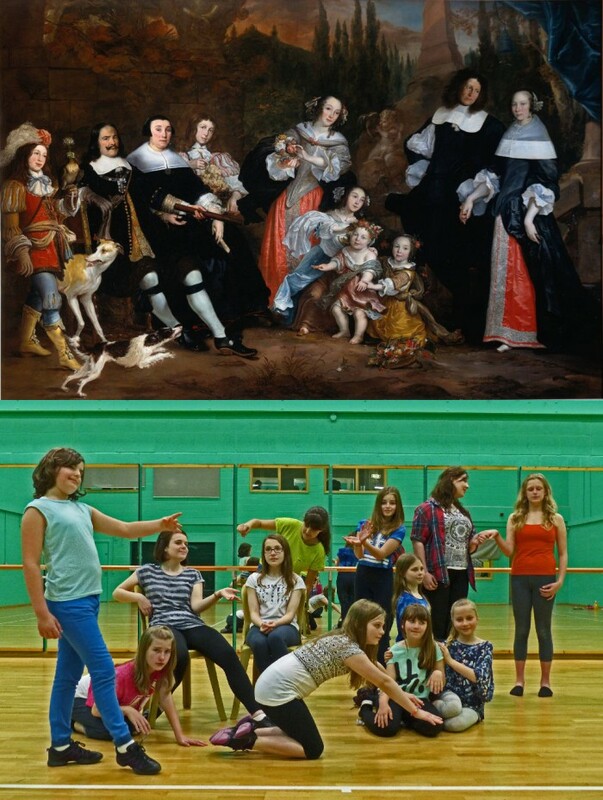 You don’t need to have studied art or be someone who goes to museums to enjoy recreating paintings with your friends. VanGoYourself is a genuinely different and deeply engaging way for visitors to interact with cultural heritage, based on emotion, playfulness and curiosity. 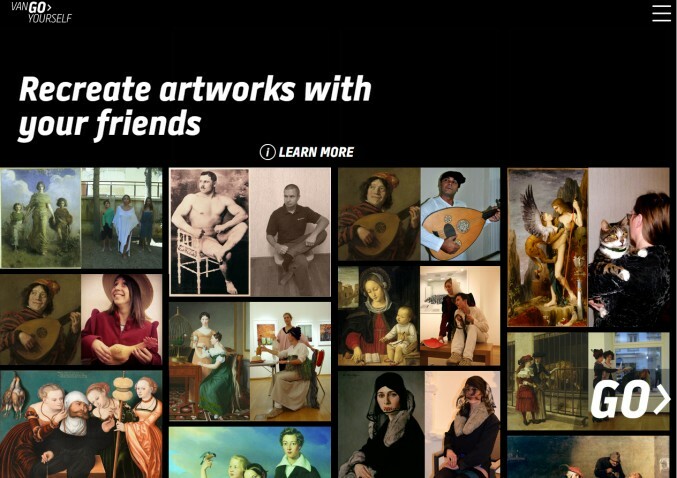 It is designed to help you rediscover and engage with classic paintings from around the world in a new way. 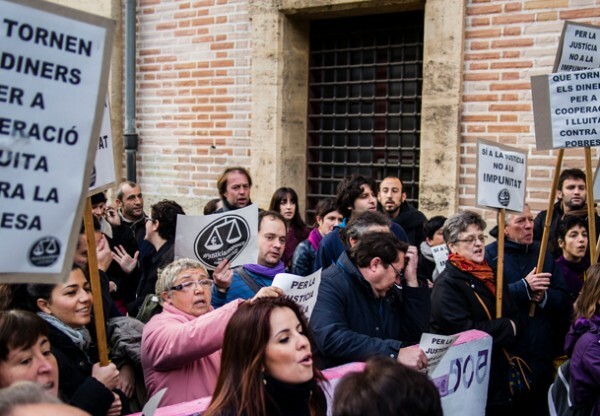 We believe the project offers a new way of highlighting the value of art in society. VanGoYourself’s inherent sociability, playfulness and photographic output helps to spread this message through networks of friends via their ongoing conversations, recommendations and sharing. The service can be especially valuable to tourist offices, museums and cities in promoting specific destinations, sites and events. It is also genuinely funny and original, offering people an easy way in to engage with paintings that invites them to delve deeper. To connect more people to art and help them discover and enjoy art in a very personal way. We will focus on adding more paintings from museums, galleries and collection holders across Europe for people to choose from, in particular filling gaps in collections from different countries, cultures, painting styles and artists. We will offer support to museums and galleries across Europe to run their own VanGoYourself events, helping to develop new audiences and deepen engagement. We will work to build a community of people from across European borders who want their experience of art to be more interactive. We will support the ongoing work to free up the wealth of open source digitised cultural resources and encourage their use by a wider audience. VanGoYourself is the brainchild of Culture24 (WeAreCulture24.org.uk) in the UK and Plurio.net in Luxembourg - both non-profit, independent art entrepreneurs with a sense of humour. Both organisations have a track record of successfully working internationally to support arts and heritage venues to reach audiences online and to challenge the views of some people who think museums can be boring. 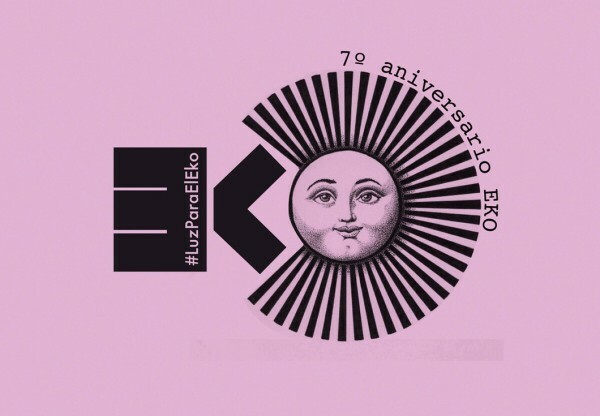 It is part of the Europeana Creative project and co-funded by the European Commission to enable and promote the greater re-use by creative industries of cultural heritage resources aggregated by Europeana (www.europeana.eu). VanGoYourself is a responsive webservice built in WordPress by Surface Impression in the UK. The design is by Spild af Tid in Denmark and the image twinning is built by the Austrian Institute of Technology in Vienna. The site won Best Digital Exhibition at the international Museums and the Web conference 2015 in Chicago, and the People's Choice award (voted for by the international community). We were also shortlisted for the prestigious Innovation award at the Museum and Heritage Show awards 2015. Contribution to WordPress community by an Image Twinning plugin to integrate such functionality in applications. Enabling new digitised paintings to reenact related to Spanish heritage collections. 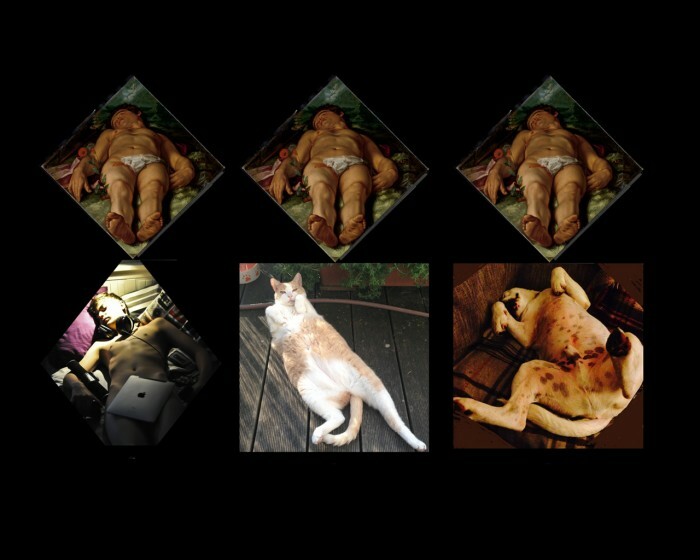 Participative reuse of digitised content from major collections in European museums and galleries, with Creative Commons licenses enabling creative engagement around cultural heritage.